‘Burst to Probe’ and ‘Stream to Probe’ are the 2 ‘Transfer Mode’ options available from EXOSTIV Analyzer to capture data. – Uses the capture unit FIFO to pre-store bursts of data. – Defines capture sizes up to the size of the capture unit FIFO in powers of 2 (min. 32). 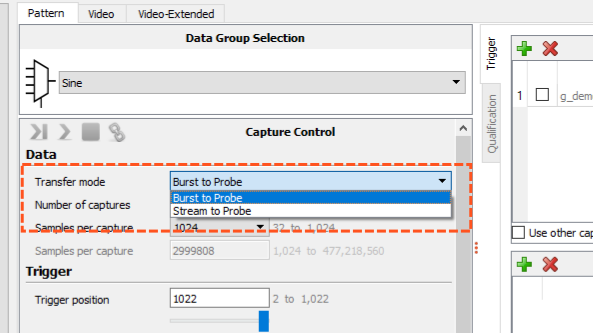 Hence, using ‘Burst to Probe’ limits the size of the capture but won’t create overflow. – Uses the capture unit FIFO as a simple buffer. – Transmits data to EXOSTIV Probe in a round-robbin scheme. – Defines any capture/burst size (up to the limit of the external EXOSTIV Probe memory allocated to the capture unit (1 / nr of capture units).